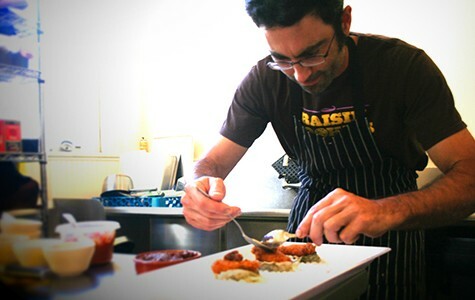 Pietro Buttitta aims to bring rare grapes, ancient Roman feasts to Oakland. Plus, an epilogue to the saga of Chiu. Winemaker Pietro Buttitta in the kitchen. Before he became a chef, Pietro Buttitta was a student of philosophy, which is probably why he seems most at home when he's holding forth on the ancient Roman cookbook Apicius, and what wines he would want to pair with those well-worn recipes. 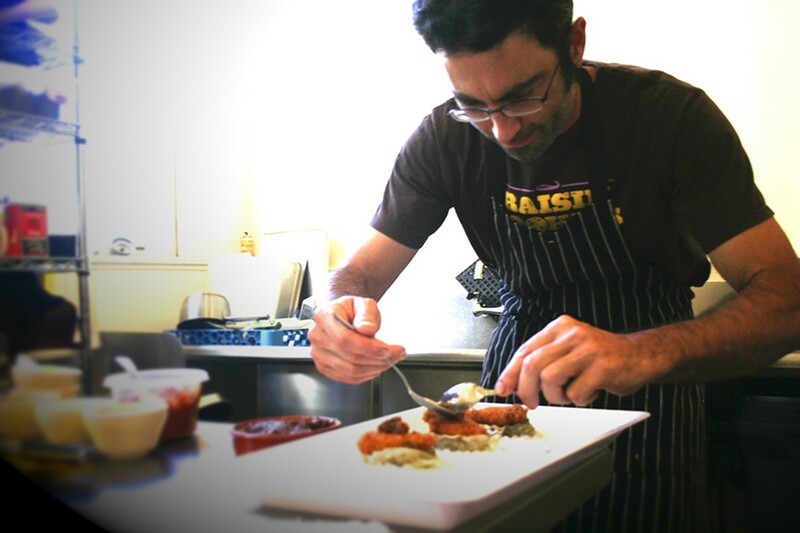 He's hardly the first Bay Area chef to profess strong opinions about an obscure, wine-related topic, but in this one respect he hopes to be unique: If Buttitta successfully launches Prima Materia, a winery and supper club (at a still-to-be determined location in Oakland), he will likely be the only chef in the city who makes the wine that he serves at his restaurant. As Buttitta wrote in his crowdfunding pitch, "The goal now is to bring these two related disciplines together in a way no one else has yet." In an interview, Buttitta explained that he's a culinary school grad who earned his fine-dining stripes at restaurants in Napa Valley and Portland, Oregon. But the winemaking is a family legacy: His father owns Rosa d'Oro Vineyards winery in Lake County, which is where Buttitta has worked as a winemaker for the past eight years, juggling restaurant gigs during the offseason. But when Buttitta started developing his idea for Prima Materia, he knew he wanted to be somewhere that was more densely populated and had a great food culture. Hence, Oakland. As for why Buttitta uses the term "supper club" instead of just calling it a plain old restaurant, that probably also ties back to his past life as a scholar of history and philosophy. His hope is to delve into food history more than your typical restaurant — to have a themed meal each week that would be built around some kind of narrative. That's why he wants to recreate Roman feasts from the 4th century AD and, as a certified sommelier, figure out what wines would be suitable for such a meal. He'd also like to do a dinner inspired by the years that writer William S. Burroughs spent in Morocco, and another based on the "saline marshiness" of the Sacramento-San Joaquin River Delta. If that all sounds rather heady and conceptual, Buttitta says there's no need to worry: He wants Prima Materia to also be a place where he can host a Carolina-style barbecue, which would fit his interest in the history of regional cuisine while also just being "nice food." In terms of the winemaking process, Buttitta said he's mostly interested in hard-to-find European grape varietals and preserving their inherent characteristics — in "figuring out what the grapes want to be, as far as wine is concerned." "I try to stay out of the way as much as possible," he added. Buttitta's goal is to make his wine onsite at his urban winery and restaurant in Oakland, but of course before that can happen, he needs to find both a location and well-funded investors. He launched a crowdfunding campaign to acquire funds to purchase grapes for making what would be the inaugural batch of Prima Materia wine, but having only raised just over $1,000 of his $16,000 target with a few days remaining, he acknowledged that it was a longshot at this point. Still, even if the crowdfunding campaign falls through, the winemaker-chef hopes to still attract private investors, secure a space, and start construction on the winery and supper club by sometime next spring. A brief epilogue to last week's story about Chiu's Moderately Ok Chinese, a fictitious restaurant whose fake Yelp reviews and incredibly appealing name led me on a wild goose chase that ended outside a random woman's house in an El Cerrito residential neighborhood. As it turns out, it was all an inside joke among a group of friends, who had posted "reviews" of their friend's dinner party (and were very apologetic when I told them about my misadventures). Just when I thought the whole saga was over, I got an email from Chiu himself — who, as it turns out, really does exist and gave me hope that the restaurant Chiu's might someday go from prank to reality. Brian Chiu, an El Cerrito resident and art department manager for a specialized printing company, told me that he did, in fact, cook all of the dishes pictured in that review — homestyle southern Chinese recipes that he learned from his parents. The name, he explained, was something he came up with in college. The idea was that if customers complained, he'd just say, "What'd you expect? We're just okay." But my biggest takeaway? Chiu said that he worked for a while as a supervisor at a Boudin Cafe & Bakery, and that he has, in fact, thought about opening a restaurant. All of which means that the dream of Chiu's Moderately Ok Chinese is still alive.